step 1 Preheat the oven to 375 degrees F. Place 2 chicken breasts in a 1 gallon Ziploc® Brand Freezer Bag and seal. Working from the thinnest to the thickest part of the chicken breast, pound each piece with a rolling pin, meat mallet or the bottom of a heavy skillet, being careful not to tear the meat, until it is 1/4-inch thick and approximately the size and shape of a 4-by-8-inch rectangle. Remove the chicken from the bag and set aside on a clean plate. Repeat with remaining chicken breasts. step 2 Lay the chicken breast on a clean work surface or cutting board in front of you, horizontally, with one long (8-inch) edge toward you and the smooth side down. Layer each piece with 3 basil leaves, 1 piece of roasted red pepper and 2 Tablespoons of the shredded mozzarella (reserve remaining mozzarella for later). Roll one long edge toward the other long edge to enclose fillings—like a wrap—making sure the edges overlap slightly. Fold in the loose (short) ends and secure with toothpicks on each side. step 3 Pour 1 cup of the tomato sauce into a 9-by-12-inch nonaluminum baking dish that’s at least 2 inches deep, and distribute sauce evenly over bottom of dish. step 4 Place the rolled chicken breasts, seam side down, in the baking dish. 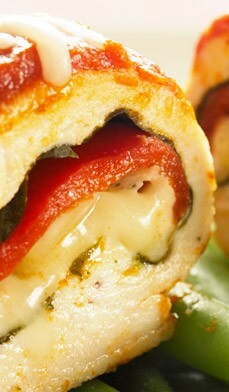 Top each roll with the remaining 1/2 cup of tomato sauce (about 2 Tablespoons each) and bake uncovered for 30 minutes. step 5 Sprinkle the remaining 4 Tablespoons of shredded mozzarella (1 Tablespoon each) over the top of each chicken roll and broil on a low setting for an additional 5 minutes until the cheese melts and browns on top. step 6 Remove the baking dish from the oven, transfer the chicken breasts to plates, carefully remove toothpicks, spoon any remaining sauce from the baking dish around the chicken and serve immediately. To avoid tearing the chicken breasts, don’t pound the meat too vigorously. If you are looking to avoid unnecessary calories, check the label on the can of tomato sauce to make sure there is no added sugar. To save time on baking day, you can prepare the recipe ahead of time through step 2. Chicken rolls can be covered with Saran™ Premium Wrap, refrigerated and baked the next day. Or place them in Ziploc® Brand Freezer Bags and freeze for up to two weeks. Aluminum pans are “reactive”—they’re affected by or affect acidic foods like tomato sauce and can actually discolor or change the flavor of the food. So use a roasting pan made of oven-safe glass or one with an enamel, nonstick or stainless steel surface.